"For me, one of the biggest thrills at the USA Film Festival was meeting the great Audrey Hepburn." "Thank you for the preview of INSIDE OUT with Pete Docter and Jonas Rivera on stage. Our kids loved the film and the chance to talk with the filmmakers after the movie made the experience really special. Our kids haven't stopped talking about the evening, but I think the parents in the audience loved it more than the kids." "One of the most powerful experiences I have ever had in a theater was at the USA Film Festival screening of the film RESTREPO, presented by filmmaker Tim Hetherington and soldiers from the actual unit in Afghanistan where the documentary was filmed. Several of the stationed soldiers family members were also in the audience that night. I will never forget the experience and the feelings we all shared." "Thank you for staging the Tribute to Studio Ghibli in January. Seeing all of my favorite anime films from the past twenty-five years on the BIG screen in brand new 35mm prints was just incredible â€“ and getting to see the U.S. premiere of THE SECRET WORLD OF ARRIETTY was amazing!" Gift Memberships on sale year-round! "The best deal in town" -- USA Film Festival Members receive more benefits for their contribution dollars than any other arts organization in town; FREE preview screenings every month, tax-deductible movies -- Compare benefits and see for yourself. Membership contributions (at all levels) to the 49-year-old 501c3 nonprofit USAFF organization are tax-deductible. Membership donations help to support KidFilm Arts-in-Education Outreach Programs for 5,000-10,000 DISD students and teachers each year. MEMBERSHIP BENEFITS -- Members receive FREE sneak-preview screenings of films every month (tickets for two) before they open in area theaters, as well as Receptions with celebrity guests and VIP Reserved Seating! We host screenings and programs every month -- Join us! 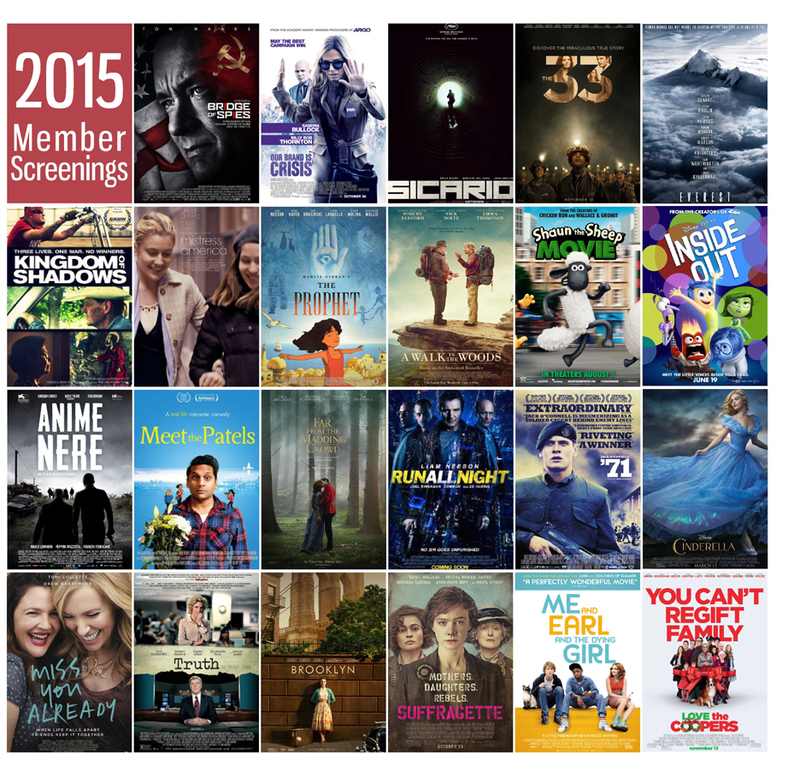 Select 2015 Member Screening titles are represented in posters above.